We are going to have a special Memorial Day post on Monday, so for today’s Photo Hunt, my human wanted me to tell you a little bit about her cat before me — a memorial of sorts. I’ve mentioned her a few times, but I never met her. She died about eight months before I came to live with my human. 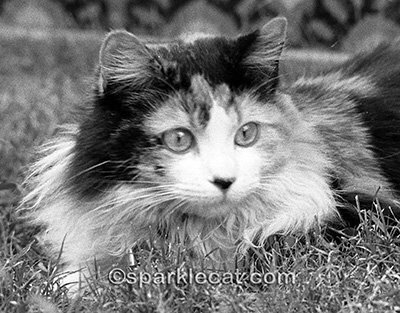 This cat’s name was Harlot and she was a longhaired calico. Do not let her innocent eyes and sweet face fool you. She was tough, she was mean, and she was a mass murderess. No bird, squirrel, rat or mouse was safe when she was around. Sometimes people weren’t either. Once a neighbor lady tried to pet her and Harlot scratched her so badly that she had to go to the doctor and my human had to pay the lady’s bill. It was easier to get away with such bad behavior in the 1980s. Why she was named Harlot: that was the one thing she answered to when my human was trying to name her. She came from the streets of San Pedro, CA. It was August of 1986 and my human had been down there for a music festival. When she and her friend were walking back to the car, they saw a bunch of kids playing with a kitten. The kitten’s forehead had been shaved into some sort of punk rock ‘do, although she seemed oblivious to this (most street kittens aren’t fashionistas). Of course my human wound up taking the kitten home, and the kitten was perfectly happy with this arrangement — until she found out that my human already had another cat! She was mad about that, and she and the other cat never did make friends. When he died, in fact, Harlot was perfectly fine about it. It meant that she had my human all to herself. 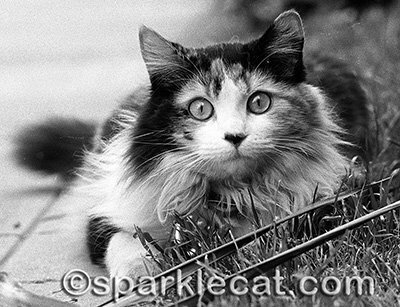 It is no wonder that this kitty answered to the name Harlot — she was a groupie! My human interviewed lots of rock bands, and Harlot tried to kiss up to every one of them. For a few weeks, the living room was rented out to a singer who was homeless after a European tour, and he was friends with Ian Astbury of the Cult. One day Ian came over and within two seconds, Harlot was giving him a lap dance. She was a hussy. She also decided that the trashcans out in back of the apartment belonged to her and her alone. Any other cat who tried to dig through her trash got a beating. Then the horrible day came: my human moved to a house on a big, overgrown hill that had only one trashcan… with a lid. Harlot was inconsolable — until she realized she now had a new hobby: killing every living thing smaller than her that lived on this big hill. She would catch squirrels that were almost as big as she was (she was little like me, only a bit over seven pounds). One time she came home with a special treat, which she offered to share with my human on the backyard pavement: a neatly severed squirrel head. The thing could have been mounted, it was so perfect. But after giving her a proper thank you, my human declined the gift, and Harlot picked up the head and took it away to enjoy by herself. See, Harlot loved my human in a way that was fierce and feral. They were more than pals, they were partners in a hostile, kill or be killed world. More than once, Harlot avoided certain death. She escaped coyotes and cars with barely a scrape and refused to let my human make her an indoor cat. Harlot could no more have stayed indoors than my human could have ever held a 9 to 5 job. She was bad tempered and utterly devoted and had the loudest purr of any cat my human ever lived with. Eventually my human bought a house of her own and when Harlot wanted attention, she climbed the tree outside her home office window and yelled at her. The windows in the living room were almost always left open so Harlot could come and go as she pleased. Never mind the fact that they were almost two stories up — that was her preferred entrance and exit. That house was also where Harlot was diagnosed with the bone cancer that would eventually kill her at the age of 15-1/2. The vet gave her a few months to live. She lasted a year and a half. And until my human sold that house, six months before Harlot died, she was still climbing the tree, jumping through the living room windows and killing small, unsuspecting creatures. Even with a tumor on her shoulder. Years ago, my human’s boyfriend drew her a Valentine’s Day card. It showed Harlot devouring a bloody heart. Some cats leave paw prints on your soul. Harlot left raw, bleeding claw marks.